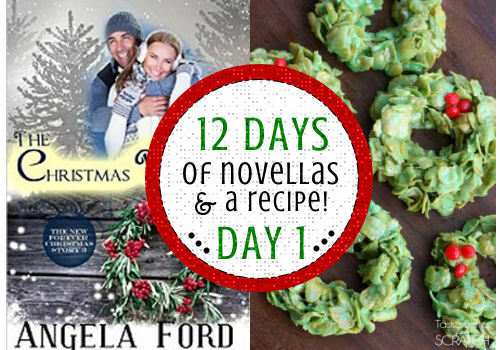 12 Days of Novellas – Day 1: The Christmas Wreath by Angela Ford: Review + Recipe! 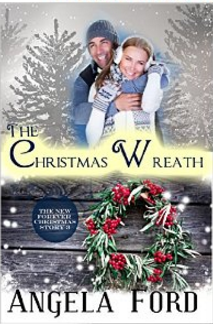 Come join me today for the review of The Christmas Wreath and a festively-fun themed recipe! Let's start this party off right by whipping up a few little goodies! 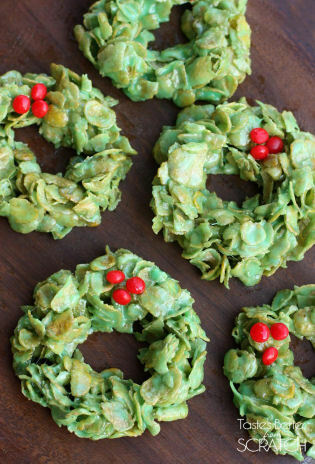 Click the pic and head on over to Tastes Better from Scratch to find out how to make these super easy, Cornflake Christmas Wreaths! Thank you very much to Lauren for allowing me the use of her festive snack to accompany today's book! Once you've whipped up your little treats, don't forget to head back here for your download and my review! Description: "Will the magic of Christmas forever connect two hearts? Annie Dixon’s love for nature and her hometown of Glenville has her driven to find a way to keep the tree farm from outsiders. When the bank grants sixty days before the tree farm is listed for public sale, Annie and her friends devise a plan to finance the buy. The death of Annie’s childhood friend brings Detective Ryder Harris back to town and ignites a flame between the two. But is he really back for his sister’s funeral? For the first time in many years, Ryder is excited about the holidays. Annie believes this Christmas will be magical until she discovers his secret. Will their love be strong enough to get past it?" Friends, let me tell you – I wanted to love this Christmassy Novella and was excited to dive in…but in my opinion it was seriously lacking. I quickly found myself confused throughout and flipping back and forth to see if I had missed anything. 2 out of 5 Candy Canes – Because one candy cane is just mean. This entry was posted in 12 Days of Novellas, Book Reviews, Christmas, Kindle Downloads, Recipes and tagged Angela Ford, Canadian Blogger, Canadian PR Friendly Blogger, Canadian Review Blogger, Chick Lit, christmas book downloads, christmas chick lits, christmas cookie recipe, christmas cozy mystery, christmas downloads, christmas kindle downloads, christmas novellas, christmas recipes, christmas treat recipe, cornflake wreath recipe, cornflake wreaths, Cozy Mystery, Hire a Blogger, Novellas, PR Friendly, PR Friendly Blog, PR Friendly Blogger, PRFriendly, Product Review Blogger, Review Blogger, the christmas wreath angela ford, the christmas wreath review. ← Ebates Cash Back Online: Earn While You Shop!